EMERGE allows sales orders or purchase orders to be set in your customer’s or supplier’s native currency. 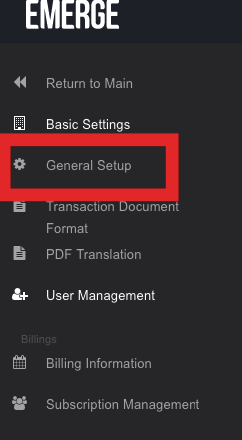 Click on the navigation panel > Company Settings. You can edit the decimal points for the currencies. In the financial reports, these transaction amounts will be converted to your base currency based on the sales order or purchase order exchange rate value. E.g. Your company is based in $USD but all your clients are from Japan and hence all sales orders are created in JPY currency. In your reports, all transactions which are in JPY currency will be converted to USD based on the sales order exchange rate value. Xero will need to contain the currency of the transactions pushed by EMERGE. You will be required to add the currencies of all your EMERGE transactions in Xero manually. An error will be prompted if a currency does not exist in Xero while attempting to push a transaction in. The base currency in EMERGE cannot be changed to avoid exchange rate complexities.